Hua Hin is the oldest and most traditional of the Thai resorts. It combines the attractions of a modern holiday destination, 5 star hotels, fabulous restaurants, gorgeous beaches, first class golf courses, with the charm and fascination of a traditional fishing port. Which is exactly what it was like when I first visited, more than two decades ago. While most other Thai holiday destinations cater mainly to foreign tourists, Hua Hin is a holiday resort for foreigners as well as Thai nationals. Besides it’s great 5 mile long beach Hua Hin provides the highest density of world class golf courses anywhere in Thailand while it’s yet virtually undiscovered as an international Golf destination. Green-fees and other costs are among the lowest in the world and course maintenance and services are kept to a very high standard. 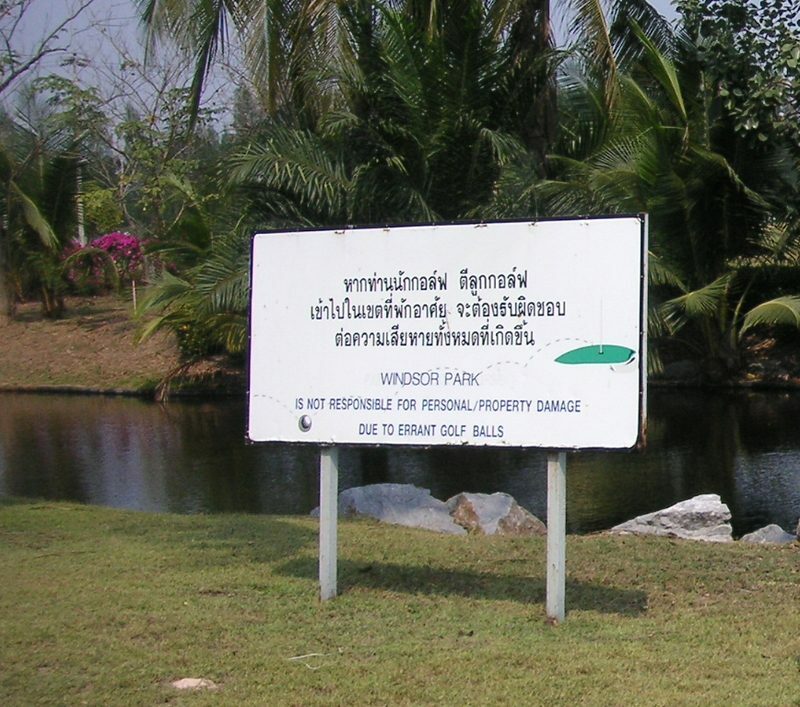 Golf in Thailand was started in Hua Hin, with Royal Hua Hin being the first course, designed by a Scottish railway engineer no less. Hua Hin has another 9 fantastic courses, all worth a visit. Jack Nicklaus has Springfield Royal Country Club, which presnets the golfer with 27 wonderful holes, all beautifully designed. Sea Pines, a kind of links course, is the newest, opened just five years ago. The signiture 16th hole has that “wow” factor, with beautiful ocean views. Must plays are Banyan and Black Mountain. Black Mountain has held several PGA games over since it’s opening and has won many awards and honours. The same can be said for Banyan, which has now been open for 9 years. It’s the course I’ve played most, not only for the golf, but the apres golf is perfect, sundowners are perfect. The resort of Hua Hin was discovered in the early 1920s by King Rama VII as an ideal getaway from the sultry metropolis of Bangkok. The tranquil fishing village was turned into the Royal resort and consequently became popular among Thailand’s nobility and upper-class. 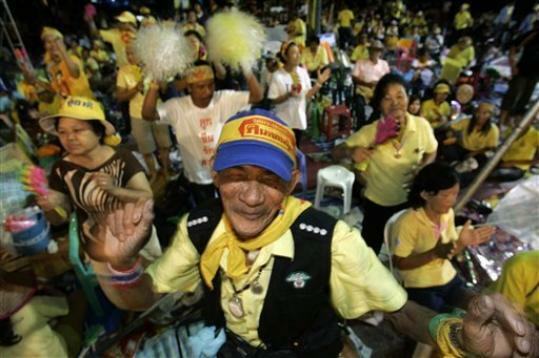 Today’s visitor to Hua Hin will still sense this special atmosphere and old world charm. Besides sun-filled days on the 5 mile-long beach there are leisure activities for the whole family from watersports and shopping to golf. The area around the town let’s you discover fabulous national parks with fantastic peaks, caves and waterfalls. 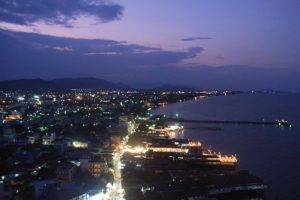 In the evening the winding streets have a great variety of shops and markets that make for a relaxed stroll, and the restaurants built on stilts into the sea offer superb seafood prepared in the age old traditional Thai way. Hua Hin has all the ingredients for a very special holiday experience. I am used to the frenetic pace of golf in Bangkok or golf in Pattaya, so whenever I head north get a real treat when I golf in Chiang Mai. 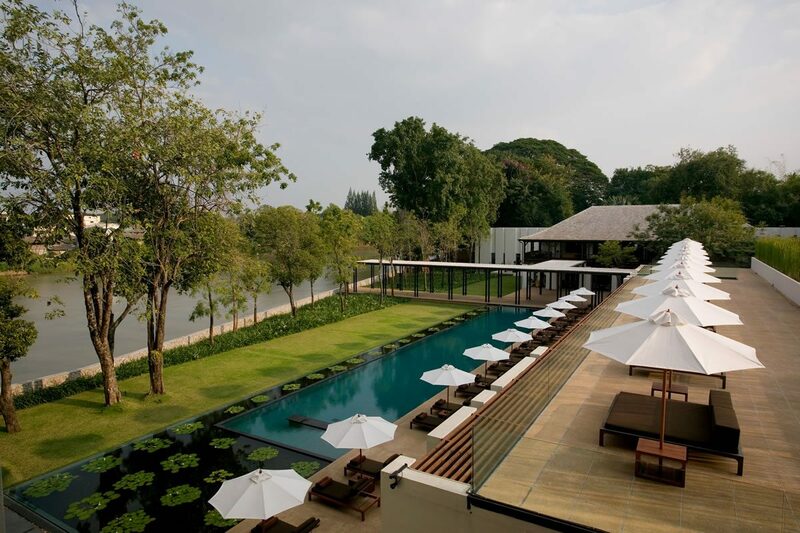 For the best Chiang Mai golf resort, I check into The Chedi Chiang Mai where I feel always welcome at Chiang Mai’s only five-star hotel located on the Mae Ping River. Close by, I explore the temples and check out the night bazaar, a mere five minute walk away. For the best golf in Chiang Mai, I drive out of town past rice fields, buffaloes, and mountains to the Chiang Mai Highlands Golf Resort & Spa. As soon as I arrive at the Chiang Mai Highlands Golf Resort & Spa their helpful staff and smiling caddies literally take over to start my Thai golf day. 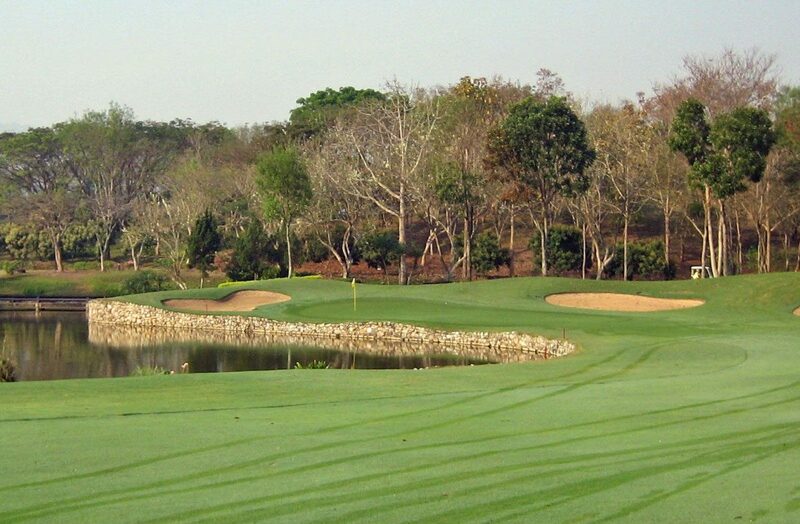 The 18-hole course is set in the foothills east of Chiang Mai. The front nine utilizes the flatter parts of the terrain, while the back nine plays up natural inclines, cleverly using the contours and landscape to dramatic effect. Opened in December 2005, the course features Paspalum fairways and Tiff-Eagle greens. The bunkers are deep and severely penalizing to errant shots, but beautiful to the golfer’s eye especially early in the morning and late in the afternoon. The greens are firm and fast but hold a well struck iron shot. Many greens slope away from the fairway putting more emphasis on strategy and local knowledge. Their first hole, a 378 yard dog leg left, eases me into the course with a relatively wide fairway and a raised green surrounded by bunkers. Three is a long 550 yard par 5 with a stream running down the left- hand side. Bunkers come into play at various places along the fairways so most of you will take three shots to get within reach of the green. Eight, a 387 yard par 4, has almost more bunkers than fairways, with even more huge craters surrounding the green. The real fun, however, starts on the back nine when I start to climb into the mist- covered mountains. Memorable holes include 13, with an elevated tee offering a panoramic view of the course. At 16, I am back battling the mountain, with a long par 4, with the fairway sloping down the valley on the right-hand side of the green. The signature hole is left for last, the 531 yard number 18. Here I tee off into the unknown down a valley, with a stream running across the bottom of the dip, with an uphill third onto the raised green opposite the club house. Overall, the course certainly is worthy of the several golf magazine awards that have been bestowed on the club and definitely worth taking a few classic golf coursepictures here! After a breathtaking day on the course, I let the magic of The Chedi Chiang Mai cast its spell. I always check-out a massage treatment at the spa and perhaps before the sun sets, take a dip in the hotel’s swimming pool beside the river. 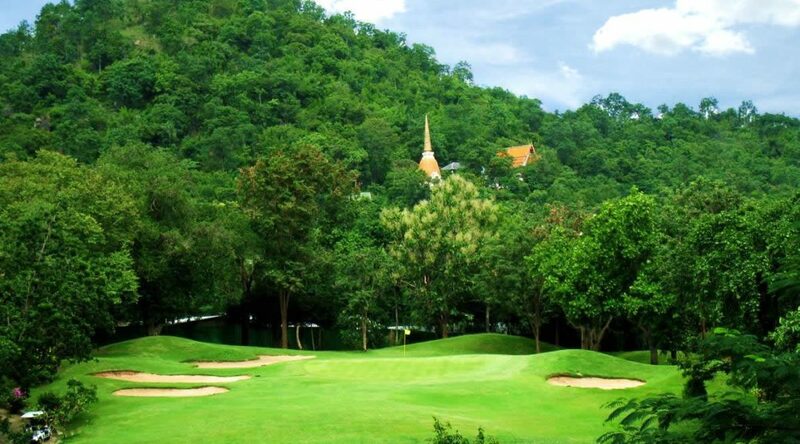 With Chiang Mai often experiencing cooler weather than other Thailand golf destinations, a visit to this region makes a welcome break from the southern golf destinations of Phuket or Koh Samui. The combination of the Chiang Mai Highlands Golf Resort & Spa and The Chedi Chiang Mai gives Thailand golfers much more than just a holiday. It is 5-star experience that encompasses great golf, superb hospitality and service in a wonderful part of Thailand. Thailand golf rivals the world’s greatest golf destinations with challenging layouts by ‘A’ list designers. If there is a difference in Thailand, it is the value. Thailand golfers enjoy championship golf at greens fees of around $100 – $150 USD which is typically less than you’d pay in Hawaii, the Caribbean, Scotland, South Africa, and other premium golf destinations around the world. But world-class aside, here is a novel idea for the adventurous. Thailand also has many off-the-beaten-path, local muni types of courses, where you meet John Q. Public (e.g. local Thai golfers and expatriates) who know where to go for the best value-for-money and some real local fun. Now, this is not for everyone, to be sure. The greens can be tricky; fairways might use local grasses; and tee boxes are probably not perfectly flat or closely mowed. You don’t play these courses for their modern clubhouses and stately locker rooms and the dining room is likely to be a large covered patio rather than a posh air-conditioned restaurant. You play these tracks for the cultural experience of encountering people living their daily lives, not catering to the every whim of tourists. You will be treated like a local. You’ll pay $12-$16 USD for eighteen holes with a caddy, not including tip. You’ll feel just like everybody else and that is part of the charm. Well, it is if you find it charming to be paired with community Thai folks and local expatriates that engage you in pleasant conversation and become new friends after 18 holes; or probably 19. Here is a great Thailand golf piece written by freelance journalist Jack Mairoo. 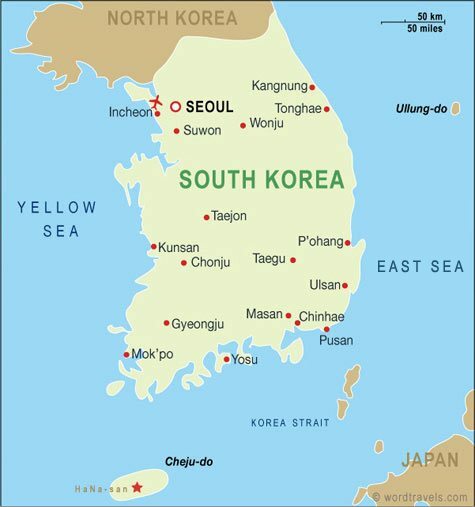 Great weather, good food, glittering temples, bargain-filled markets, stunning beaches and verdant golf courses…. A dream! For an increasing number of visitors, Thailand is the ideal recession-friendly golf holiday destination, down to a tee. If you were one of the millions who saw "The Hangover Part 2", then you probably know this raunchy sequel takes place in Thailand. If you've seen the first one, you pretty much know what happens in part 2. Instead of Las Vegas, they're in Bangkok…. And there starts the problems! Like the first one, memory loss is involved, and the characters try to reconstruct what happened to them the night before, revealing layers of insane and embarrassing incidents. The cool part, though, is that it's in Thailand, and the movie depicts many of this great country's treasures, such as its architecture and traditions. 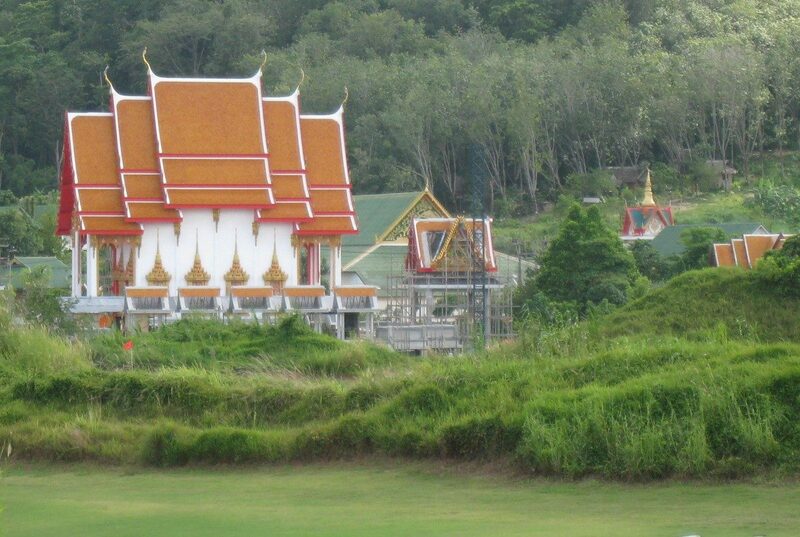 Of course, Thailand also has some mighty fine resorts and pretty fair golf courses. Being there all year round, I can attest to the golf and hotel scene, which is outstanding. 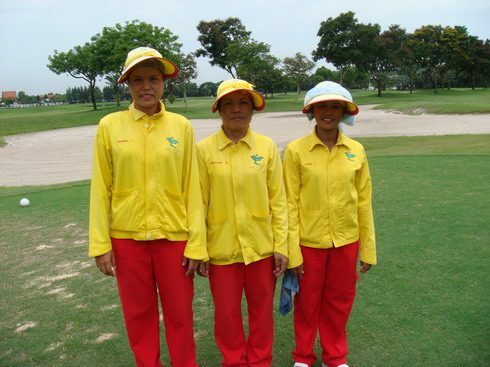 The one thing that really sets apart golf in Thailand, however, are the caddies – they're all women. And if you're thinking along the Hangover lines, think again: these ladies are actually very well trained for the most part, are professional and know their way around a golf course. And they are mandatory, which means you can't go ultra-cheap and decide not to take one. The mandatory part is actually pretty cool because it puts people to work in respectable jobs. You can also get a massage right after golf, and it's very affordable. (I call Thailand the land of the eternal massage, which might be better than golf but isn’t because I simply love golfing and I do enjoy a good massage). A foot massage for around $10 isn't uncommon, and if you're walking the green, there's nothing better. Or you can go for a full-fledged Thai massage, which is more like chiropractic session than a massage, but totally feels good after golf. The bottom line is if you're looking for an exotic golf vacation, Thailand should be high on your destination list. The water's clean, the food's good, the cities and the sights are interesting. And the best part of all: the people are really friendly and respectful. Enjoy golf in Thailand to its fullest! A round of golf usually finishes at the 18th hole at most golf clubs. Then it’s off home for a cup of tea or a hot chocolate before bed. Well one of the pleasures of taking a Bangkok golf holiday is the fun just does not stop at the Bangkok golf course. Bangkok not only has over 60 golf courses, but it is also known globally for its excellent shopping, great cultural attractions, great spa and massage, and of course a wide variety of restaurants and night life. The great thing about Bangkok is it is all there out in the open. Shopping malls and local markets dot every station along the sky train making then super accessible at any time of day. A spa or Thai massage store can be found on practically every street corner. A Thai or foot massage can be a daily après golf ritual for every Thai golfer as prices are only $10 USD an hour. Bangkok being the Thai capital has so much infrastructure, that the choices for dining and entertainment are limitless. Whether it is an authentic Thai meal, formal French meal with imported wines, or you prefer something more casual like a British pub, Bangkok has it all. After dinner, you can take in the Bangkok skyline with a cocktail at any number of bars located high above town in the city’s skyscrapers. Sometimes I think golfers on holiday forget that the game of golf is all about getting out in the fresh air to hit some balls and then have a cool drink with your fellow golfers afterwards. Maybe it is because we have been brain-washed. Golf in the 21th century seems to be all about one up man ship and this is being fuelled by the manufacturers with their massive marketing campaigns. 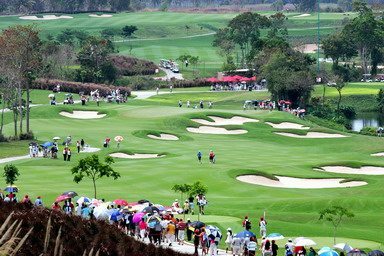 Of course there is the friendly banter among Thailand golf holidaymakers and the occasional wager on the match, but in general I have found playing golf in Thailand a very friendly and enjoyable experience for all who travel here for their golf vacations. Sure we would all love to play at St Andrews, Troon or Augusta, but I bet it’s a lot more fun to have an experienced Thai caddie telling you that you have 138 yards to the middle of the green or to aim one cup left of the hole. 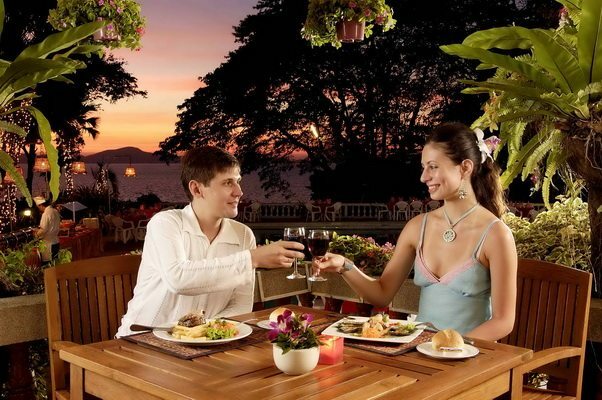 There are many good Italian restaurants all over Bangkok in various price ranges. The ones at the Sheraton on Sukhumvit and the Dusit Thani hotels are both very good at the higher end. Others I like a lot that are more moderately priced include La Gritta on Sukhumvit Soi 19, Basilico on Sukhumvit Soi 33, Via Vai on Sukhumvit Soi 8 and Limoncello on Sukhumvit Soi 11. All offer a great pizza and nice wines as well as an assortment of homemade pastas and more. This one is almost impossible because great Thai food is served up in so many places. Even the street food can be good though I don’t particularly enjoy sitting in plastic chairs on the sidewalk and dining a few feet from diesel belching busses while dodging the motorcycle taxi boys flying past our table. For cheap and good, I like the outdoor corner restaurant just a few meters down Sukhumvit Soi 14 from the Asok Skytrain. At the higher end, the better hotels almost all have good Thai restaurants. It’s hard to go wrong with Thai food in Thailand and often the difference in price is more related to the atmosphere than the food itself. Those who have visited Thailand agree that it is almost impossible to explain for those who haven’t. Different. Even just plan weird. The Tourism Authority of Thailand’s official slogan of ‘Amazing Thailand’ sums it up fairly well though comes off as just another cheeky marketing slogan until you’ve actually experienced it. Even among Asian cultures it stands out as unique. Thailand is one of the few places in Asia that has never been under the rule or dominance of a western country, which may explain some of its’ uniqueness. 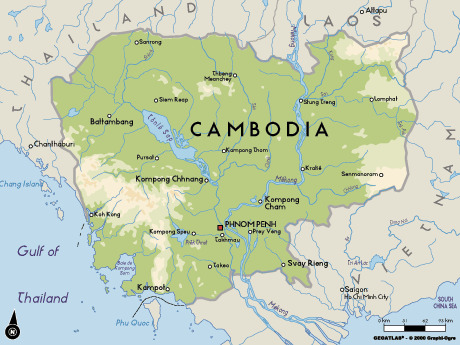 Also the country has little war history other than long ago border conflicts with Burmese, Khmers and Laotians. The rulers of Thailand have long been able to avoid war and outside rule by deftly playing off leading world powers against one another to remain on good terms with all. The weirdness begins from the moment you land in Bangkok, whose airport name is written Suvanabhumi but pronounced “Sue wanna boom’“. Even pilots and flight attendants frequently get it wrong during in flight announcements. Fly up to Chiang Mai. Or is it Chiangmai? Or Chang My? As there is no official transliteration from Thai script to the Roman alphabet you can spell it anyway you want. Street names get really weird as different maps spell the same roads differently while the actual signs on the road may vary from any of them. Is Thailand safe for a golf holiday? I regularly get asked this question regarding a golf holiday in Thailand. While Thailand has been in the news for all the wrong reasons recently, it still surprises me of people’s reluctance to travel to Thailand. Thailand is much more than Bangkok and Bangkok is more than just the two streets that was involved in the political unrest in May. Also, there are so many destinations in Thailand that make great golfing holidays in Thailand, all where life and golf have been and continue to go on normally. For example, Phuket is the most popular area of Thailand for golf holidays. It is a beautiful tropical island with nice beaches, countless options for hotels, dining and nightlife, and perhaps the best and most varied golf in all of Thailand. Phuket has its own international airport with direct flights from most Asian and European capitals. Phuket is a one hour flight from Bangkok for those who prefer to connect or combine a Phuket golf vacation with other Thailand golf destinations. Want to plan a Thailand golf vacation but also need to make sure your non-golfing travel partners are happy? No problem. Below are some of the more popular non-golf activities to include on your golf holiday itinerary. Massage: Thai massage, Swedish massage, jet lag massage, sports or golf massage, foot massage, neck & shoulder massage, fish massage, aroma therapy, hot stone therapy and more. You are never far from a spa in Thailand. Most good hotels have them and you will find many more all over the country. 1. Best of Bangkok Tour: Includes the Grand Palace, the city’s most famous temples and a long tail boat ride on the Chao Phraya river. 2. Thai Cooking School: Fun hands-on experience as you cook (and eat) a multi-course Thai meal. 3. Siam Niramit: Dinner and Thai culture show. World class stage production is one of the best of its kind. When golfing in Thailand remember these 5 simple points of golf etiquette and everyone will be assured of a satisfying golf experience. 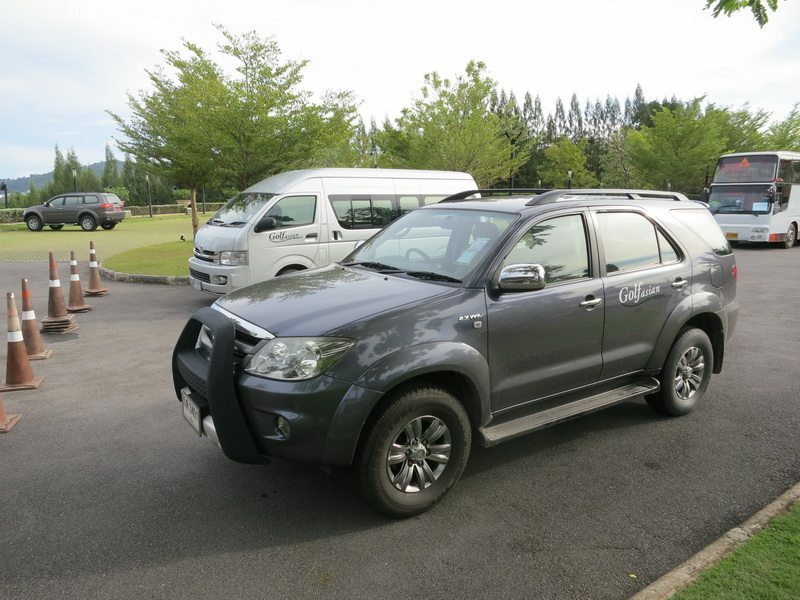 The overriding principle is that consideration should be shown to others on Thailand golf courses at all times. Unlike many sports, golf in Thailand is played without the supervision of a referee. The game relies on the integrity of the individual to show consideration for other golfers in Thailand and to abide by the rules of golf. You should conduct yourself in a disciplined manner, demonstrating courtesy and sportsmanship at all times, irrespective of how you are shooting. This is the spirit of the game of golf in Phuket and all golf destinations in Thailand. When golfing in Thailand, you should ensure that no one is standing close by or in a position to be hit by the club when you make a stroke. You should not play until the players in front are out of range, especially at the best golf courses in Pattaya such as Siam Country Club. If you hit a ball in a direction where there is a danger of hitting someone, immediately yell (not whisper) FORE, even when playing golf with Thai golfers who speak Thai. 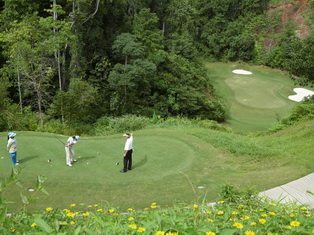 Always show consideration for other players on the Phuket golf course and do not disturb others play by moving, talking or making any unnecessary noise. 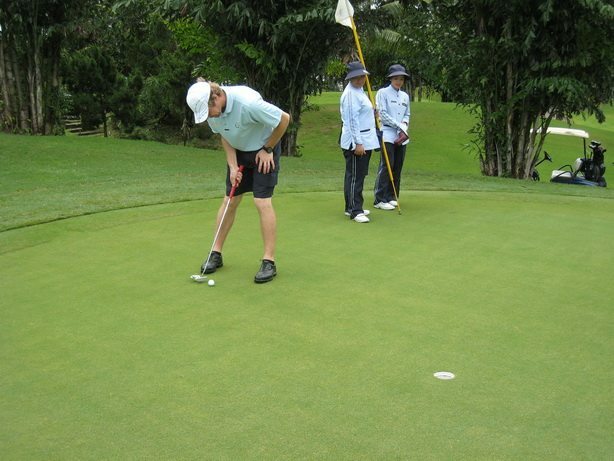 Thailand golf visitors should ensure that any electronic device taken onto the course does not distract other players. TURN OFF YOUR CELL PHONE ON THE COURSE! 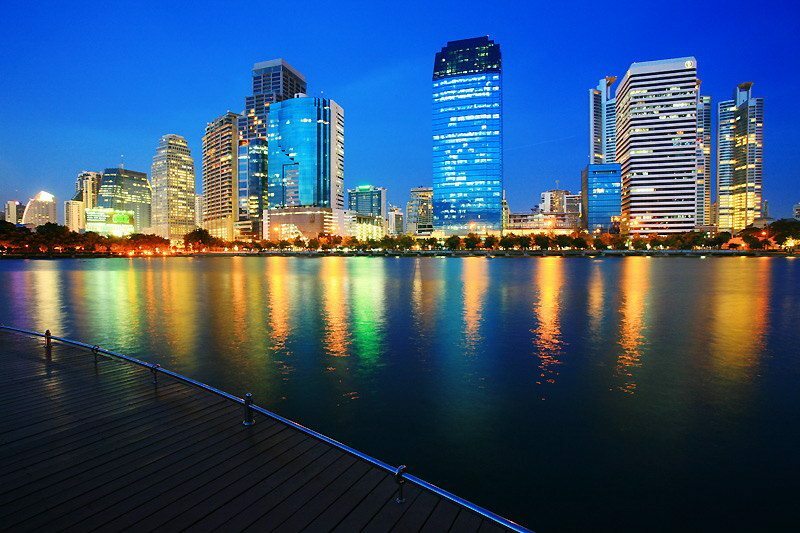 Bangkok was recently rated as the 2008 World’s Best City by “Travel + Leisure”. Here is my take on the eight reasons why. 1. Abundance of world class hotels and resorts. I can not think of another city with more 5 star resorts, readily available vacancies, and costs for luxury accommodations as low as Bangkok. 2. Some of the regions best shopping including both local centers like MBK (clothes and telephones), Chatuchak Market (everything under the sun), Pantip Plaza (computers) , and Thaniya Plaza (golf equipment) and luxury shopping malls like Siam Paragon and the Emporium. 3. Mind-blowing, spicy, and healthy cuisine such as Som Tom (papaya salad), tom yum goong (spicy soup with coconut milk and shrimp), rice noodles with minced pork (a golf course favorite). 4. 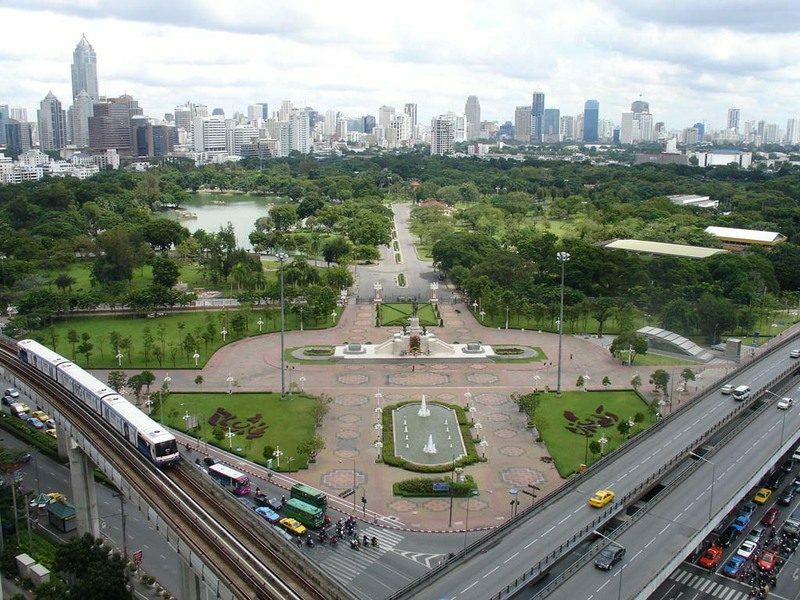 Efficient transportation including the sky train, subway, highways and links to airports and Bangkok golf courses. For those of you planning on a Thailand golf holiday, here is the real situation as of 12:00 noon on Wednesday September 3. A state of emergency has been declared in Bangkok city as a result of clashes between pro- and anti- government protestors which have turned violent. A number of state enterprise labor unions are to stage strikes and to selectively cut water and electricity to government offices, halt buses and disrupt train service throughout the country. The Bangkok protests have been confined to a small area around the main government buildings and the capital’s major tourist sites and all golf courses remain open as usual. Where I live and work in Bangkok life goes on as usual. We are watching the political situation closely and hope that will continue to be the case. 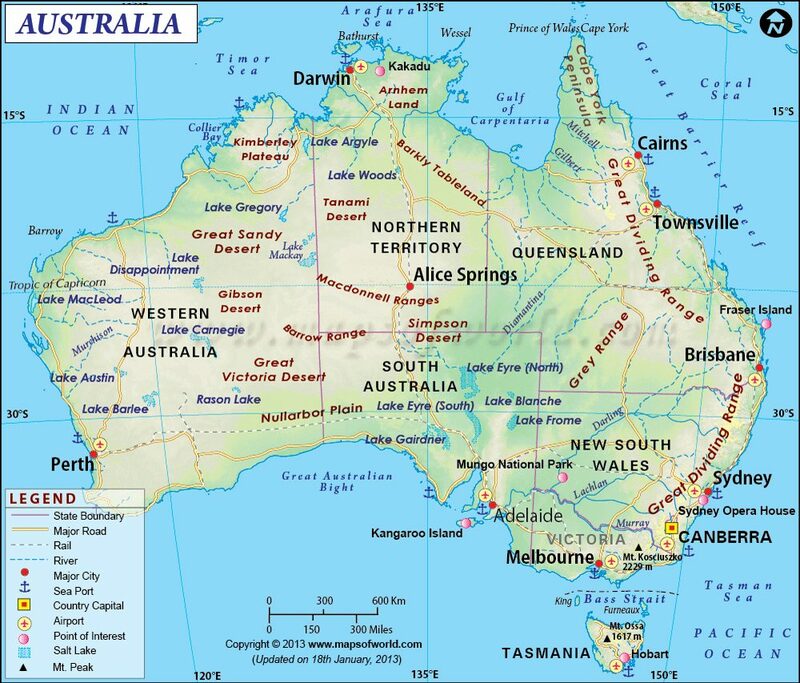 While it is impossible to forecast what the situation will be in the future, the history of this country is that when there is any political turmoil it is settled quickly and life goes on with minimal or no impact on golf or tourists. Lets hope so this time as well! In the meantime I will continue to post updates as the situation further develops. If you have any questions, feel free to email me at mark@golfasian.com. 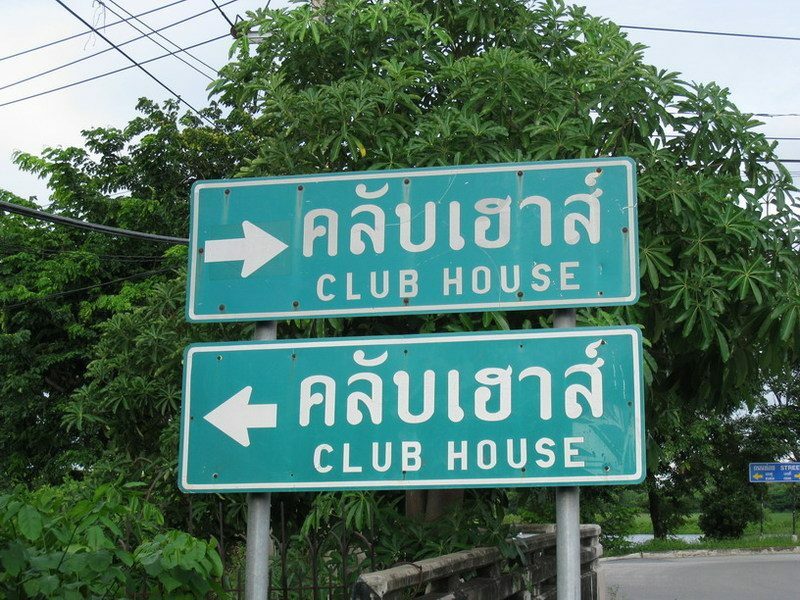 What would you do if you were on the way to a Thailand golf course and came across this sign? Well I came across this sign at Lakewood Golf Club in Bangkok on Friday and it made me chuckle. Guess it put me in a good mood because I shot 3 under my handicap. The Bangkok golf course was in the best condition that I have ever seen it in and that probably helped a bit as well. Fast greens, well defined fairways, and even consistency and firmness of the sand bunkers made playing at Lakewood a joy. For those looking for a fun round of golf in Bangkok, take note; the golf course was practically empty on a Friday! If you ever came across any amusing tales or signs playing golf in Thailand drop me a line or send me the golf image and I will get it posted for you. Have a great round and remember, think positive and you will shoot par! 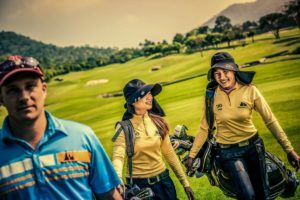 Do you want to be admired and respected by golf club staff, caddies and other local Thais on your Thailand golf vacation? Here’s a tip: learn a few words of Thai golf vocabulary! Aside from hello and goodbye (sawadee), are you well? (sabai dee mai), and what is your name? (khun chue arai), good luck (chok dee) is a nice thing to say when you are leaving someone, or when having a drink and raising your glass to someone (like “Cheers!”). Remember, though, to be polite by ending with krap if you are male (even if this grates on western ears), or kaa if you are female. 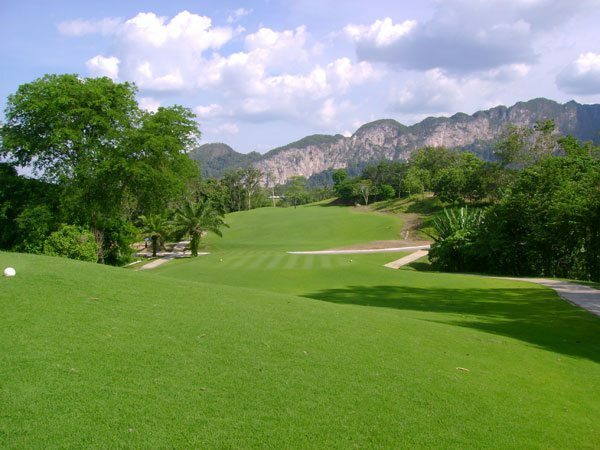 Thailand golfing terms include: golf course (sanam golf), go to play golf (bai len golf), wood (maai), iron (lek), left (sai), right (gwaa), straight (trong), uphill (tee lum), downhill (tee soong), and small or little (nid noi). 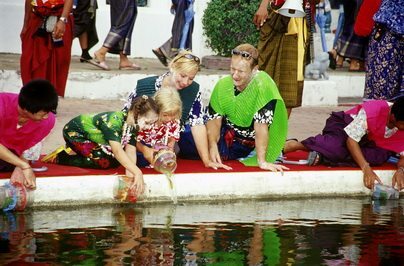 Do you want to be admired and respected by golf club staff, caddies and other local Thais on your Thailand golf vacation? Here’s a tip – wear the right color clothes on the right day! In Thailand the days of the week are named after the planets in the same order as some Western countries. In Thai, wan (pronounced wun) means day and it comes before the name of the planet. Each day is also associated with a color. Traditionally, people wear items of clothing according to the color of the day. A friend of mine’s wife and her family are always appreciative when he wears the appropriate color each day. So for a New Year’s present, they have given him a variety of different colored golf shirts. He now has the full set and they try to insist that he wears the correct colored shirt each day according to the following chart!! 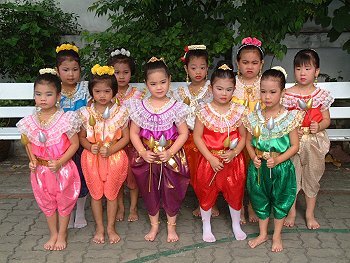 The Festival is called Loy Krathong, and it takes place on the full moon in November. During the evening, many people will go down to their local klong (canal) or river or even the beach to float their krathongs. They believe this will bring them good luck. The krathongs (small rafts traditionally made from a section of banana tree trunk – although modern-day versions often use Styrofoam) are decorated with elaborately-folded banana leaves and flowers, and contain a flower, a candle and three incense sticks which are lighted before being placed on the water. The people usually make a wish at the same time. Some believe that if the candle remains burning until the krathong is out of sight then their wish will come true. By the end of the evening, there are hundreds of flickering lights bobbing up and down on the water. Overall it is really a memorable evening and a great way to compliment golf in Thailand. Happy Birthday to Her Majesty the Queen of Thailand! August 12th is the birthday of H.M Queen Sirikit and a Thai public holiday. Lucky for golfers, since August 12th falls on a Sunday this year, the holiday is celebrated on Monday the 13th, this giving those who golf in Thailand a chance to get in an extra round of golf as the courses are less busy than normal due to the Thais visiting their families. This day is also known in Thailand as "Mothers Day" as Queen Sirikit is regarded as the mother of Thailand. Children young and old will also take time this day to pay respect to their mothers, usually presenting them with flowers. Two Pattaya golf courses, St. Andrews 2000 and Rayong Green Valley, even have Mother’s Day specials whereby mothers get free green fees on this day. The Hua Hin Golf Festival is also coincidently held during this time of year. 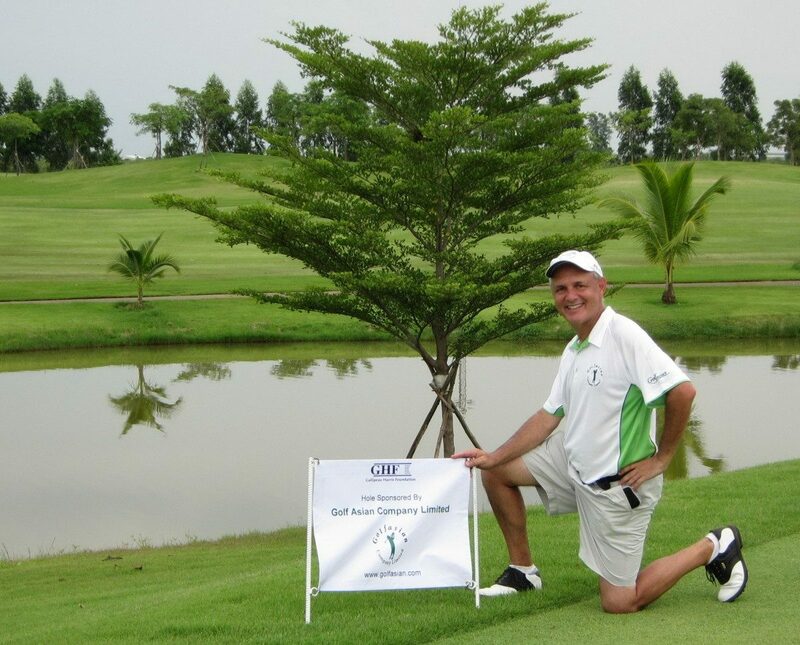 Special green fees are available at all Hua Hin golf courses. 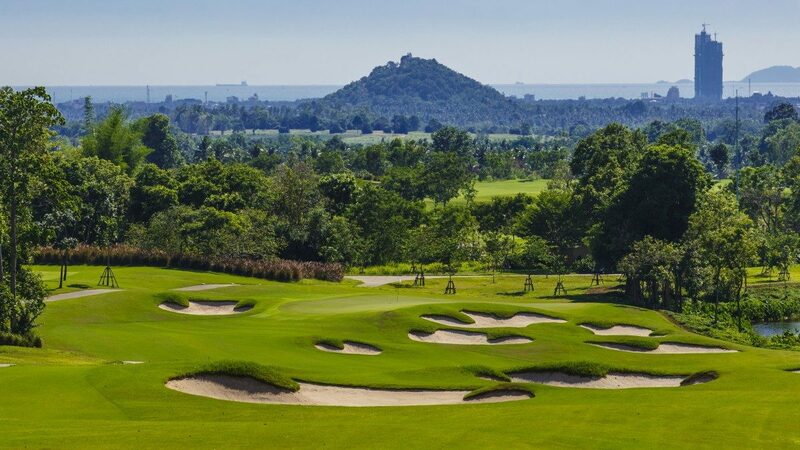 The Jack Nicklaus designed Springfield Golf Club can be played for only 1000 baht per round. Even the new Black Mountain Golf Club, while not specifically participating in the Hua Hin golf festival, is offering reduced green fees.